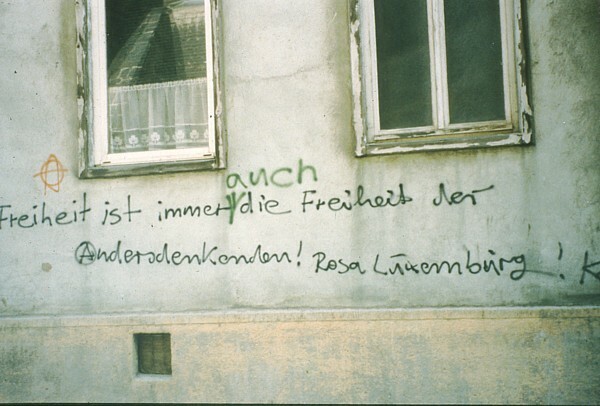 Rosa Luxemburg, 1917: 'Freedom is always also the freedom of those with differing opinions." 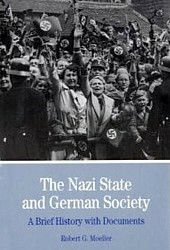 Books used: Fritsche, Germans into Nazis; Moeller, Nazi State and German Society: A Brief History in Documents; photocopied reader with 10 articles (cover & TOC). select a quotation that states the author's main argument (thesis) for that section, adding a short 1-2 sentence explanation in your own words of that argument. Please include the page number where you found each quotation. Type this up as a separate document that you can print out to have in class for discussion on Thursday. But for Tuesday by noon paste your answer into this assignment on Gauchospace as "online text." To give you an example of how a quotation can set out an argument, in the first, previous section in that chapter, Fritzsche outlines what he'll argue in the subsequent four subsections: p. 28: "Over the course of four wartime winters, Germans would mobilize their energies, vitalize public life, and rearrange their political conceptions around the nation rather than the state or the monarchy." Thus he will argue that through four social experiences most Germans went from focusing their allegiance on the Kaiser or the state before the war, to thinking of themselves as a nation of people who themselves comprised the state. In that same paragraph he restates the overall argument of the chapter: "...the war provided a national frame in which Germans made sense of their experiences and gave voice to their aspirations." In fact he will argue that over the course of the war many/most Germans came to realize that they could no longer rely on the state apparatus to take care of them, but that they had rather to take matters into their own hands to overcome the dire situation. Jan. 5, 2016: Updating for Winter 2016 course offering: in process, stay tuned. Aug. 2014: posting the Fall 2013 133B syllabus and source assignment handout (both pdfs). Note that I haven't been doing much on my course pages since 2009 because I've been relying on our "Gauchospace" (moodle) web-based Course Management System to distribute course materials, so these course sites have been sadly neglected. 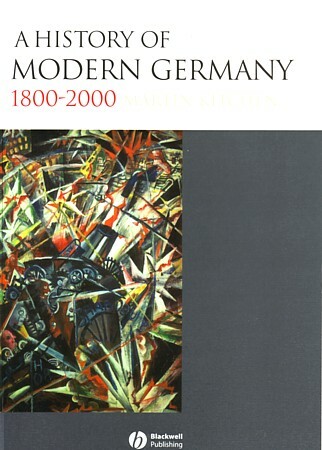 Q2 (1/22): At the end of chapter 2, Fulbrook writes: "Whatever the ambiguities of Weimar society and culture, perhaps the deepest and most fatal splits were embedded in the Weimar social compromise, and in the institutional framework of relations between the classes. It was these which contributed mightily to the breakdown ..."
Name and briefly describe 2 such compromises between different institutions or interest groups. Be sure you name explicitly what those four institutions/groups are. Q3 (1/29): Based on the Bergen textbook's chapters 2 and 3 (also Fulbrook chap. 3), briefly describe *four* people who were instrumental in Hitler's rise to power during the 1920s. Be sure to mention what role they played in that rise. Q4 (2/3): Based on Bergen chapters 3 & 4, select four important events from 1933 to 1939, and explain briefly why each is important. Q4.5 (2/10): This is a place for me to add the points for the in-class responses to the film by Evie Sullivan, which is comprised of clips from interviews with 3 people who experienced Kristallnacht in Nov. 1938.
selfishly (give no thought to the consequences for others). For each, suggest *why* they did those things (what reasons or motivations they had). 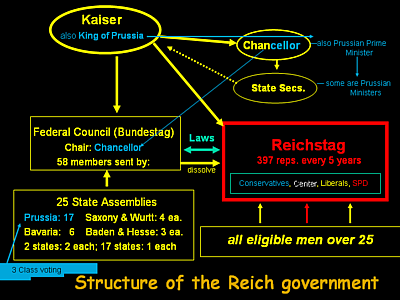 Q7 (3/5): For the five categories denoted by “EIEIO” give a brief explanation of the role each played in the collapse of Germany in the final year of the Nazi regime (June 1944-May 1945). Be sure to specify which groups of People or Oppositionals, and Elites or Leaders you mean. I would expect that you draw on textbook chapter 8 and lecture. Q8 (3/? ): In class exercise; worth 2 points (added to 4 max points for Q4.5). The Local - Germany's News in English--site features local and national German news. The DHM's LeMO -- "Living Museum Online" has taken its place, unfortunately without an English translation. LeMO's Bestand (collection) has lots of excellent text, images, audio, etc. Not to miss: the newsletter archive (weekly 2005-2008), cultural archive, archives of speeches since 1996-- it's endless! The US Embassy in Germany has a "History of German-American Relations" site with great documents from 1683 to the present, easily navigable with great e-texts (some are in my 2004 Hist 133c course reader) and links. If you want to contact me, read my note on grading, below. With the extra credit factored in, 20 students got an A, 12 A-, and 3 B+; the rest stayed the same. I don't give A+, sorry. And obviously, this web site is under construction. 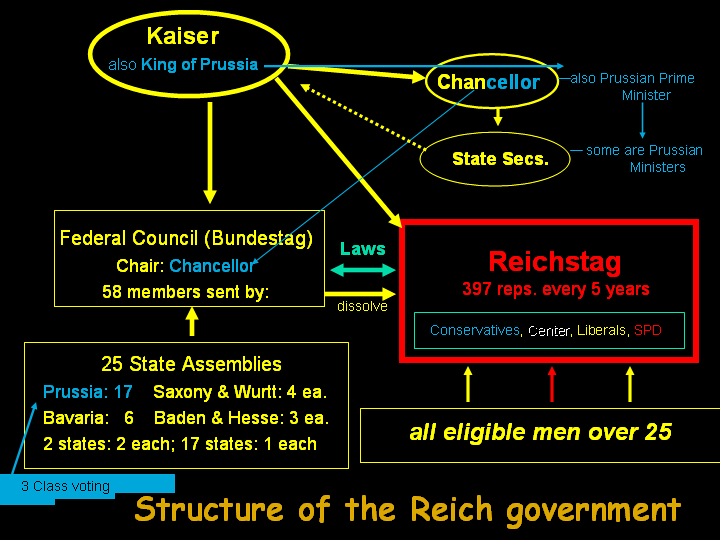 Jan. 13, 2007: 2007 syllabus and Reich-Prussian gov't diagram now available. I don't think I'm going to be able to put lecture notes online this quarter--I have too many other obligations that don't leave me the "extra" time. No more than *1* page total (5 bullet points). I vastly prefer a typed version, but this time (only) I'll accept handwritten ones as well. Name the 5 Chancellors from 1926 to 1932 (W. Marx to von Schleicher), and give 2 important features of each of their governments, e.g. "character," important issues, and/or party coalition supporting them. Correction to syllabus: on the front under "grading" the total value of the 8 questions should be 30%. Each is worth 4 points, so you can actually get 2 bonus points. Jan. 28, 2007: A student pointed out that the topic lists are due this Thursday ONLY for students who want to try for the no-final-exam option. If you prefer the take-home final, your topic list is not due until Thu., Feb. 8. Sorry about my mix-up. Also, if you are a good note-taker, you can earn an easy $100 from the Disabled Students Office for photocopies of your lecture notes. If you are interested in this position, please see me after class on Tuesday. If several students are interested, I will recommend you based on your notes from last Thursday, so you may want to bring a photocopy of those notes with you. Jan. 31, 2007: links to last quarter's (Hist 133a) book essay and web option handouts are fixed. 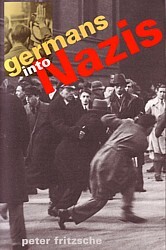 Name 2 paradoxes about the Nazi use of violence. Name 2 ways that Nazism changed family and/or village life. What changes in the Hitler Youth gave rise to alternative movements by the late 1930s? Describe 2 such movements (1 sentence each). List 4 of the 7 bases of the Hitler Myth. What one event did most to deflate it? Feb. 15, 2007, 8am: I didn't hear about it early enough to plan any alternative activity for our class during the anti-war strike today, but since I think this is one of the most urgent contemporary political issues facing us today, I don't think it would be appropriate to hold "class as usual." So: no attendance taken today; Q5 for next week will be announced on e-mail, and I'll make a web page to cover the lecture material. And anyone who wants can borrow the video I show. I encourage everyone to attend the central rally at 1pm at the Pardall entrance and express your opinion about our wars in the Middle East and Afghanistan. 1. What offer did Major Trapp make to his men on July 13, 1942? 2. Name TWO reasons some of the men who did not accept that offer gave to explain why they did not accept it. 4. What aspect of the Milgram experiments did sociologist Barrington Moore think was most important? European history, will present "Island of the Blessed/Island of the Damned: Jews and Austrians in Modern History." Here is a copy of the WW2, Genocide & Perpetrators handout. What reason does Rees give why, after Aug. 31, French authorities sent children to Auschwitz only with their parents? What reason did/do French gendarmes give? Give two reasons why Oskar Groening joined the Waffen-SS. Name the three locations Annette and Michel Muller were imprisoned, with the type of place each was (e.g. abandoned factory, WWI fort). What was the advantage of locating a "normal" concentration camp like Dachau in a suburb, as opposed to in a remote forest, like Belzec, Sobibor and Treblinka? In what program did Wirth and Stangl first gain their murder experience? Why were males aged 16-40 the first ones to be deported? Why could at most 10% of them be unfit for work? Should we think of French gendarmes (such as Bousquet) as protectors of Jews, or assistants in their murder? How should we assess Else Abt's and Oskar Groening's behavior in Auschwitz? What does the story of the Muller children's survival tell us about the Holocaust? Finally, I've been asked to announce that there will be a planning meeting for Holocaust Remembrance week, on Tuesday 3/6 at 5pm at UCSB Hillel (the hour+ before I show Escape from Sobibor at 6:20 in HSSB 4020). March 9, 2007: Q8 is due Tuesday. It is based on the last chapter of the Bessel book, and is on the L18 "Legacies" handout (with link to a webpage on the "special paths"), as well as in this announcement (part of the text was cut off on the handout). I've also uploaded the 133b Web Option handout. Q8: Date and briefly characterize the 3 "narrative turning points" in Ernst Bromberg's life story. Which "special path" model would best fit with Bromberg's narrative? Oral presentations: I didn't discuss these and won't be available to meet with potential presenters before Tuesday's class, so I'm going to suggest that we do them on Thursday instead. If you are interested in making a short (5-7 minute) presentation about what you learned from your essay book, please e-mail me by Monday 8pm . We can meet Tuesday afternoon or Wednesday for further discussion. I'd like to underscore again that the overall quality of the essays this quarter is truly excellent, better than I've ever seen before. Paper pick-up. All papers that haven't been picked up yet (except: Samantha R's, Andre's, and Josh's) will be available in the envelope outside my office door by noon today (Friday). March 16, 2007: L19: Postwar and L20: Overview and Summary handouts now available. The L20 handout has the final exam instructions, IDs, and 8 essays questions to choose from. Note that there is a "semi-web option:" if you received an A or A- on your book essay, you can still publish it on the course web site instead of answering the ID portion of the final. See the L20 handout for details. March 22, 2007, 1:30pm: Student Essay index page now complete; 27 essays uploaded. Nov. 23, 2008: Josie Levi Martin, a Holocaust survivor who will be speaking to our class after we read a selection from her autobiography, was miraculously spared from the Tea Fire last Thursday. See this 11/20/08 Noozhawk article by Rob Kuznia: "For One Resident, Survivor's Guilt Taking Emotional Toll After Tea Fire." Josie's 2002 book is Never Tell Your Name ($13.50 & searchable at amazon). Jan. 3, 2009: Enrollment is currently at 44 of 48 spaces, with 6 people already on a waiting list, several of them with priority status. The list is now closed until the start of classes, and enrollment through Gold is closed as well. Starting here, all announcements until 3/24/09 were sent out as emails from the Gauchospace forum. You only need to read chap. 2 for starters. 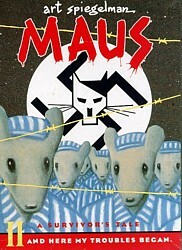 Also, I've given them Maus, both my copy and the library copy, to be placed on reserve. I don't know that they are there yet, although I was told it might happen today. Hopefully by Monday. Jan. 11, 2009: The UCSB library reserves for this course now has vol. 1 of Maus available. On the course eres site you will find the Fulbrook reading. Jan. 13, 2009: Q1 now available. The first of the 8 midterm questions is now available on the Gauchospace course website. It is due Thursday by the start of class. The library has had my copy of v. II to put on reserve since last Thursday, but they still haven't made it available. I'll check into it Wed. morning. Jan. 15, 2009: I may have forgotten to say this, but you should bring a copy of your answers to Q1 and your notes on Maus, as well as the books themselves, to class today. Jan. 20, 2009: Q2, due Thu 1/22, available. I posted Q2 on Gauchospace earlier this evening. It is due Thursday by class time. It will require careful reading of Fulbrook chap. 2. And hard copies of the book proposals are due as well, with photocopies of reviews. Jan. 21: Q2 Clarification/hint: I received a good question about Q2--is the answer in chap. 2 or chap. 3? Well, it is in both. Fulbrook mentions the early creation of the 2 agreements (between 2+2 groups) in ch. 2, and in ch. 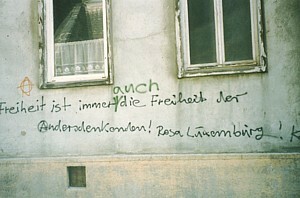 3 she explains how the agreements fell apart, contributing to the instability of the Weimar state. Jan. 28, 2009: Q3 available. A reminder that Q3 is due Thursday. Also, I'd like to announce a talk that is starting right after our class at 5pm in HSSB 6020. Professor of History Mary Sarotte (University of Southern California) will talk about the dramatic events of 1989. Drawing on newly released documents from Washington, Moscow, Warsaw, East Berlin, Bonn, and London, Professor Sarotte shows how U.S., Soviet, British, French, West German, and East German leaders competed to advance their visions for post-Cold War Europe. The decisions they made had far-reaching consequences and helped to shape the era we inhabit today. Feb. 11, 2009: Q5 and supplementary pdf available. Q5 is available on the Gauchospace course website. I have also made a separate pdf of pp. 106-141 (and the prologue) of Josie Levy Martin's book, which is available there as well (the initial portion is on eres, password: front). Your insight and question from Josie's reading can be based on that selection as well, but it must not be. Q7 is due today by class time. If you resubmitted to qualify for the web option and did qualify, you have at least until Friday at 3pm to submit your supplements, until Monday at 4pm if you need that additional time. If you did not qualify or do not want to do it, resubmit today (Thu) your graded and commented essay, showing what you changed. If you are choosing the web option, submit today a printout of your supplements, as well as separate printouts of any longer text passages you are changing. Finally, I tried to add some information and links about writing annotations to the Gauchospace page. If you click on the main link for this week, it only brings up a google search result page. However, if you click in Resources under Activities IN THE LEFT COLUMN, you will see under week 9 the full text I wrote. You can copy and paste those links in your browser. I hope this is helpful, and see you later today. Mar. 12, 2009, 10am: What is due today (Thu). Several people are asking about deadlines and the file uploading. Let me try to clarify. Q8 is NOT due before class. It may be in-class or due next week. HAND IN THE CORRECTED WEB SUPPLEMENTS THAT I HANDED BACK TO YOU LAST WEEK. You should have made the indicated corrections in the electronic version, OR noted on that marked-up hard copy why you did not correct specific ones. Be sure to sign the pledge at the end. The electronic file (.doc or .rtf) containing your corrected web supplements and book essay, and optionally an image, should be uploaded to Gauchospace by 8pm tonight. If that poses a problem, let me know after class, it is not a big deal. Mar. 12, 2009, noon: More clarification & upload form link. > new one that is corrected. Also, the second type of uploading, copying certain elements (book info, about author, abstract) from your web supplements file and pasting them into a form on a web site, is not ready yet. I am meeting with the programmer after 2pm today to see whether/when he will have it ready. I will update the web option folks in class today on this. If you click it and it doesn't work, you may have to cut and paste it into your browser's address window. (Or compare the email and the address window to make sure it is going to the right place. Mar. 13, 2009: Upload page available. For the students doing the web option, the upload form page is now ready. The annotated bibliography part of the form was still too full of bugs, so I just deleted it. 1. Most of you have your word processor set to use "smart" or curly quotes and apostrophes. These will not display properly. I would appreciate it if, once you click Preview and notice the strange characters that have replaced them, that you scroll down to the filled out upload form and use the " or ' keys on your keyboard to replace them. 2. (especially for Darcy and Ryan O. ): if you have special or non-alphabet characters in your name, it's best just to leave them out for now. They will generate weird characters (as in 1 above), and the filename in the URL will simply leave them out. I hope this is clear. Try to upload your information by Saturday at noon, as I will begin checking the files then. Send me an email if you are having problems. I will try to get about 10 essays uploaded by the end of Saturday, then I will be away from Sunday until late next Thursday. I will continue the uploading on Friday, 3/20. So if you have questions, you should ask them by Sat. at 9pm. The announcements sent via Gauchospace end here. Mar. 24, 2009: This quarter I used the Gauchospace course website, with mixed results. Integrated email is nice, and uploading the midterm questions is easier, but the rest can be a pain. And it doesn't make the course materials themselves available after the course is over. I've just updated the Student Essay Index Page with this year's 37 essays. Spelling of their name and the book info on the Index page. Italics did not get lost in the conversion? All external links and internal navigation links work (note that Ebsco, Jstor etc. won't work outside of the UCSB domain). Check all links in the bibliography, navbar link. Do you think the annotations in your bibliography rate an * on the index page? Let me know and I'll review them. Mar 25, 2009 [emailed via Gauchospace]: grade distribution available; web essays ready. There you will also find the link to the 133b web option essays index page, with a list of a few things for you to check. If you find any problems, let me know--since email quickly gets overwhelming, please enter your notes on the space on the Gauchospace site. Once you give me those, I can enter the "links last checked" date. Thanks, and I hope you're having a good spring break. Nov. 4, 2010: We are going to have a guest speaker on the second day of class: Christian Petry, the author of one of the best books on the White Rose student resistance group in Munich, titled (in German): Students under the Guillotine. A course reader of photocopied essays and sources. Since UCSB's implementation of an online Course Management System in 2009 most documents for this course were made available there. .